Cheap Flights Mexico — Discover the cheap flights in and to Mexico. Several cheap Mexico airlines service the country, making travel around Mexico inexpensive and easy. With Viva Aerobus, Volaris, Interjet and ClickMexicana all offering discount airfares and deals in Mexico, you can find low fares between most major cities and beach resorts — like Mexico City, Guadalajara, Monterrey, Hermosillo and Cancun. One of Mexico’s cheap airlines, VivaAerobus, services some US cities (Las Vegas and Houston). 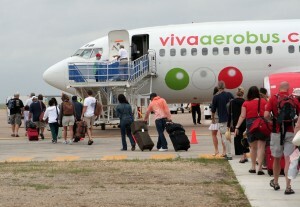 VivaAerobus also flies from Hermosillo directly to Monterrey and Guadalajara. 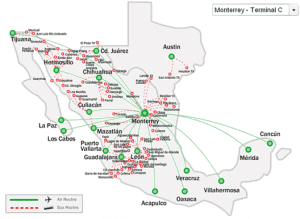 From Monterrey there are many flights to other destinations around Mexico. Volaris flies from Hermosillo direct to Guadalajara, Tijuana, Puebla and Toluca. Toluca is about 45 minutes west of Mexico City and is Volaris’ hub. From there, you can fly to many other locations. Interjet flies direct from Hermosillo to Mexico City, and from Mexico City, around the country. It also offers hotel packages. MexicanaClick is Mexicana’s cheap fare airline, based in Mexico City and servicing numerous cities throughout Mexico, Havana Cuba and Miami. A recent search revealed a round-trip flight from Miami to Cancun for 4,029 pesos (about $311 USD). Many of these cheap airlines in Mexico quote their fares in pesos and you may want to use on online currency exchange to convert the quotes to dollars.